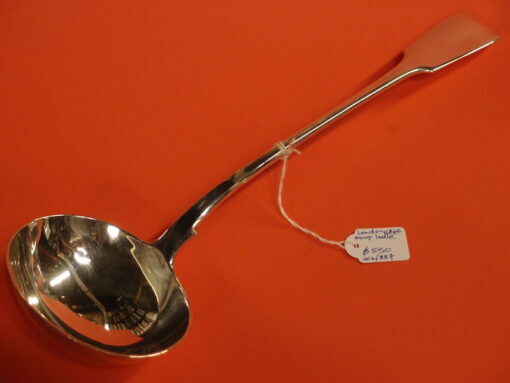 This soup ladle is Early Victorian, being hallmarked for London, 1845. 288 grams and 35 cm long it is Fiddle Pattern. Maker EE within quatrefoil. : Elizabeth Eaton, whose mark was registered in 1845. We are quite fond of having lady silversmiths' work. This soup ladle is Early Victorian, being hallmarked for London, 1845. 288 grams and 35 cm long it is Fiddle Pattern. Maker EE within quatrefoil. : Elizabeth Eaton, whose mark was registered in 1845. We are quite fond of having lady silversmiths’ work.